There are friends (I might be one of them) who will tell you, "Quit your job and follow your dream." But Jon Acuff is smarter than that. Quitter is about going from cubicle-bound to Outward Bound without committing financial and marital hara-kiri along the way—and actually succeeding in the end. This book is wise, personal, funny and loaded with practical, real-world insights from Mr. Acuff's own ongoing odyssey. 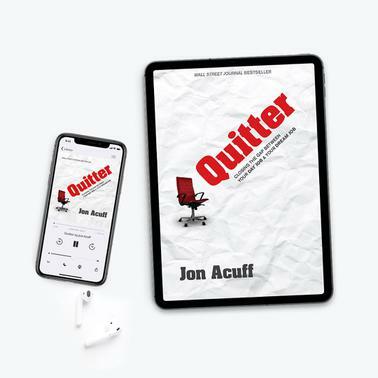 If you're torn between living your dream and putting food on the table for the wife and kids, don't make a move till you read Quitter. Quitter will entertain, enlighten and challenge you to commit yourself to Mondays Of Joy instead of looking forward to the weekend so you can finally live. Over the last few years, I've watched Jon turn a small "what if" idea into a full-on dream job. This is not a book of theories or half-baked concepts. It was born in the crucible of one man's experience. It is full of news you can use. Now. In your own life. If you are ready for a field manual for creating your dream job, this is your answer to prayer. We all have dreams of doing something great with our lives—and sometimes we think this involves quitting everything we know. Quitter addresses this topic with enthusiasm and wit. If you're serious about following your dreams, this book is a must-read.